After reviewing many educational apps, I started putting lists of my favorite apps by subjects and kids age. 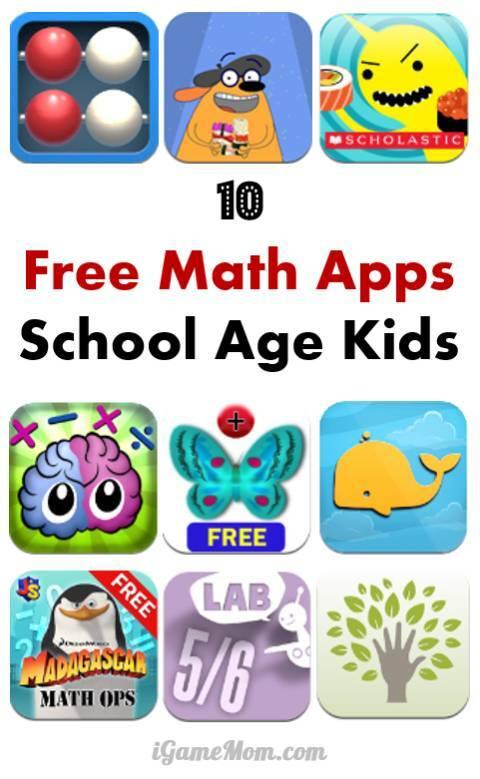 Today’s app list is 10 best free math apps for elementary kids – some are on single subject, such as fraction value comparison, some covers broader range of subjects. But all apps here are FREE, and are well designed. All are fun to play too. Hope they will help kids enjoy math more. I also have lists of 10 Free Book Apps for Preschool Kids and 10 Free Book Apps for School Age Kids. Make sure checking them out too. Sushi Monster : a free app from Scholastic, it is fun and challenging at the same time. Kids practice addition and multiplication by feeding the monster sushi. Different from typical math fact apps, it is all about reversed math – kids need figure out what numbers will sum up to a requested numbers. 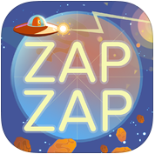 Zap Zap Fraction : is a free app teaching kids the concept of fraction. It has two parts: lessons and challenges. Kids learn the concepts at the lessons, and then play games to test their knowledge and skill at challenge section. It is a good one to use if your child is learning fraction. Butterfly Math Addition Free : takes hands-on approach teaching kids math concepts of counting and addition. It is fun to catch the butterflies. If they answer the question right, kids get rewards of tiles to add to the coloring page. Both the butterflies and the tiles are small, so it is also a good fine motor practice. Kids also have to practice a lot to finish a coloring page. Khan academy : Although it is not a math specific app, I like the math tutoring very much. It is a good go-to place to seek further clarification on some learned concepts or learn new math concepts. You can watch the video via wifi, or you can download the video on your device to watch it on the go. MathLands : Instead of simple math facts, this app focuses on math logic, problem solving and critical thinking skills to help kids gain math intuition. There are six games in the app, all requires out-of-box type of thinking. As kids solve the problems, and difficulty level increases. It can be a good family game. Madagascar : kids solve math problems to free the Zoosters. The math problems include addition, subtraction, multiplication and division, and are designed for kids in grade 1 to 4. After solving the math problem, kids then play an angry bird like game to break the cages where the Zoosters are kept. Oh no fraction : Fraction is a math concept that is easy to understand conceptually, but can get tricky when doing comparisons. Oh No Fractions is a simple FREE app helping kids understand fraction comparison with intuitive visual presentation that brings the meaning of the numbers to live. A+Click : it is actually not an app, but a website. However the website is fully functioning on iPAD. What make this site special is the problems carried on this site are not just simple math fact drills. All problems require logical and creative thinking, and math is just a tool or a stepping stone in the problem solving process. Learn math with Beluga : a free app that is going to cover math from counting numbers to Calculus, but will be released in phases. Currently it already covers a broad range of math concepts and skills with many games available. From what I can see now, it is a fun app definitely worth downloading. Number Rack : It is a very simple app with endless ways to teach math to young kids. With 10 lines of beads, and 10 beads on each line, kids can move them along the line to learn counting, addition, subtraction, or even simple multiplication and division. A great tool for teachers to use in the classroom too. Fetch Lunch Rush : from the PBS Kids show Fetch with Ruff Ruffman, it is a very active game. Kids do math, and they have to walk around to hunt for the answers! The math problems are single digit additions and subtractions. With augment reality, kids will actually see the correct number of lunch orders drop in front Ruff, the host. It is a very engaging math game. KenKen is a math logic app that ask kids to solve math problems with a logic twist, similar to Sudoku. The actual math operation involved is just addition, but many different puzzles with different rules making it fun to work with. 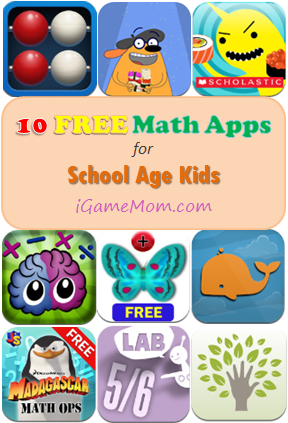 Do you know some good and free math apps for school age kids? Leave the name in the comment, I will update the list. Looking for more math apps for kids? Visit 45 Math Apps for Kids – Grouped by Age and Learning Objectives and Best Math Apps for School Age Kids. You may also like Best Math Learning Tools on iPad and Other Tablets. 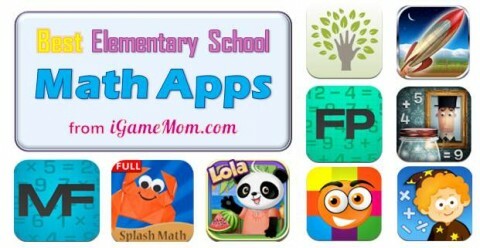 These are apps teaching kids math concepts via interactive activities. We stumbled over here coming from a different website and thought I might check things out. I like what I see so now i’m following you. Look forward to finding out about your web page for a second time. For early elementary my daughter loves the Todo K-2 Math Practice app on my iPad. I just hope they come out with an upper level version once she outgrows this one! Thanks for sharing the app. I have to check it out. These look like fun. Thank you for the recommendations. you are welcome. Hope you find one or two that you can use. Thanks! We needed some multiplication practice! MultiFlow is a good multiplication practice app http://ow.ly/o8xuX – it is not free, but pretty good. Off to find out how many of these are available for Android!